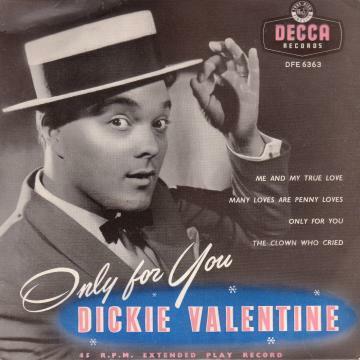 Dickie Valentine's show business career went back to his childhood. As the child actor, Richard Bryce, he appeared in several moving pictures and became a theatre call boy during his teens. He trained as a singer while doing this job and got his big break with the Ted Heath band, with whom he became known by his adopted name 'Valentine'. He proved to be a talented and popular entertainer who was able to bend his vocal style and provide impressions of other famous singers. However, he was much more than just an impressionist and had great success with his own brand of romantic ballads chalking up two #1 hits during the mid-1950s. The EP shown on the left was one of around ten that Dickie had released during the 1950s. Despite this, the singer's EPs are surprisingly difficult to find. According to the sleeve notes on this one, it is claimed that he started his film career at the age of three. Obviously, his parents had no reservations about a career in show business! Dickie's star rose and fell again during the 1950s, probably because his big-band crooning style belonged to an earlier era; by 1960 his chart career was over. Despite his lack of hit records, he remained a popular live performer and appeared regularly on TV. Sadly, Dickie Valentine died in a car crash during 1971.